Edition #2 of the new podcast Earthgauge News for the week of Oct. 15, 2017. A weekly Canadian environmental news podcast featuring the top environmental stories from across Canada and around the world. Join us here every week or subscribe in iTunes or your favourite podcast catcher. In my post below, I recommended following a new investigative reporting series being produced by The Tyee. I commend this initiative as it is important, timely and deserves our attention. Now for some thoughts on what The Tyee is hoping to achieve with this project. This is not really accurate. I agree that “Oil sands full stop” seems highly improbable for the reasons that David points out, but “Oil sands full bore” is very much within the realm of possibility and is in fact the desired outcome by many (most?) of those individuals in government and industry who are currently controlling the levers of power. Will an appeal to “the middle path” as this Tyee project endeavours to do convince the political and economic masters to alter their course? I am highly skeptical. Yet such a “solution” is only feasible IF both of the so-called “extreme” positions are in fact wrong. In other words, if the truth therefore lies somewhere in the middle. If it turns out, as many scientists believe, that climate change and the state of the global environment is so serious as to warrant a revolutionary shift in how we produce and consume energy, it seems to me that the “middle way” will only delay, yet not solve the inevitable crisis staring us in the face. Yes, it’s true due to political/economic realities that we can’t/won’t shut down the tar sands or get off fossil fuels tomorrow but that doesn’t mean taking such a position is wrong from the perspective of what science is now telling us. I fear that any meaningful solution will not come from an appeal for all of us to “just get along” (R.I.P Rodney King) but will only come through conflict and confrontation. I hope I’m wrong about this. When I talked with Mark Ruffalo last November – whose organization organization Water Defense is trying to bridge the movements working to stop mountain top removal, hydro fracking and tar sands mining – he said that we had entered the era of “extreme energy”. As supplies of conventional fossil fuels dwindle, we are employing increasingly extreme methods to extract energy resources from the earth. Energy companies are increasingly using the technique across Canada, where there is already regular seismic activity and an ever looming threat of various sized tremors. The process involves blasting water, sand and chemicals deep into the ground to fracture rock to obtain oil and natural gas. The U.S. Geological Survey is set to release its findings Wednesday that a “remarkable” increase of quakes in the U.S. midcontinent since 2001 is “almost certainly” the result of oil and gas production. Opposition to fracking has ramped up since the release of the 2010 documentary “Gasland,” which shows residents of small town Colorado setting alight tap water they charge was soured by nearby oil industry activity. Fracking causes earthquakes, studies confirm – Technology & Science – CBC News. An independent major study of fracking has found that there is no evidence to suggest that the practice – in which water, sand, chemicals are pumped into wells to break up deep layers of shale and release natural gas – has contaminated groundwater. However, the report does conclude that contamination tends to happen closer to the surface when gas and drilling fluid escapes from poorly lined wells or storage ponds. The study, which appears to be wholly independent from undue influence by the natural gas industry, did not see a need for new regulations specific to fracking, but for better enforcement of existing regulations of drilling in general—such as those covering well casing and disposal of wastewater from drilling. It will be interesting to see how this plays out in the ongoing battles over fracking in the U.S. and Canada. But is the larger question here not about fracking itself but the increasingly apparent need to move away from fossil-fuel based forms of energy? Doesn’t fracking represent the growing extremes to which we are willing to go in order to extract and burn every last drop of the earth’s diminishing fossil fuel reserves? Maybe it’s high time we figure out a plan for how we as a global community are going to wean ourselves off the “crack” once and for all. Environmental Policy news: Fracking impacts reviewed in major study. 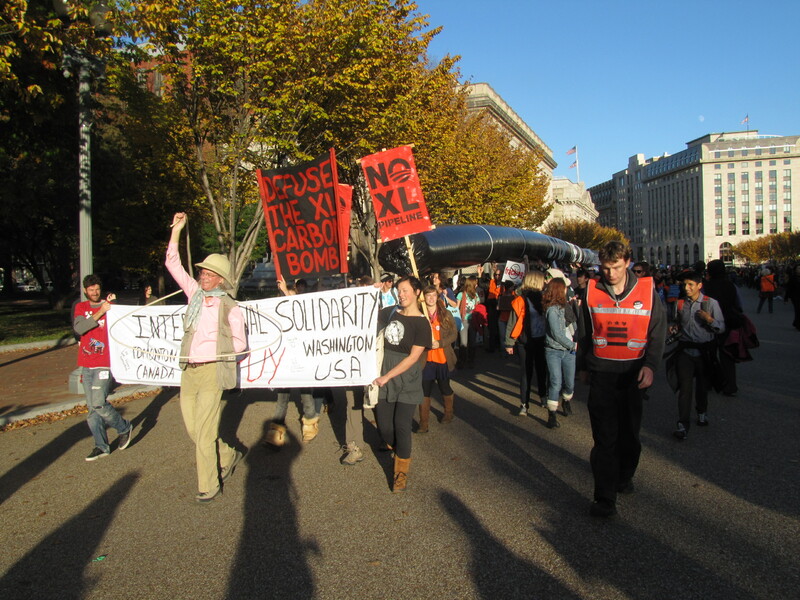 I just returned from Washington DC where I was covering an action to pressure President Obama to deny the permit required for TransCanada to construct Keystone XL, a massive, 2700 km pipeline that would transport tar sands crude from northern Alberta to the Gulf of Mexico. 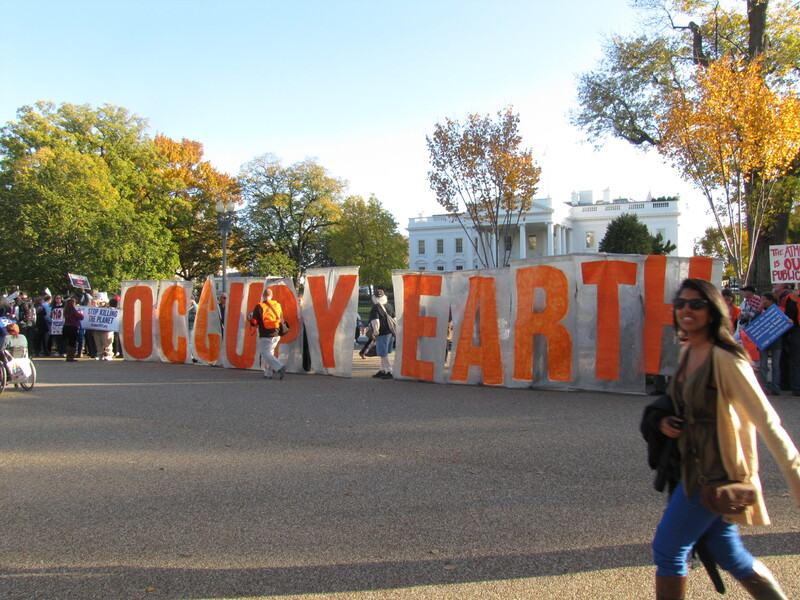 The event was very well-attended, exceeding the expectations of event organizers, Tar Sands Action. 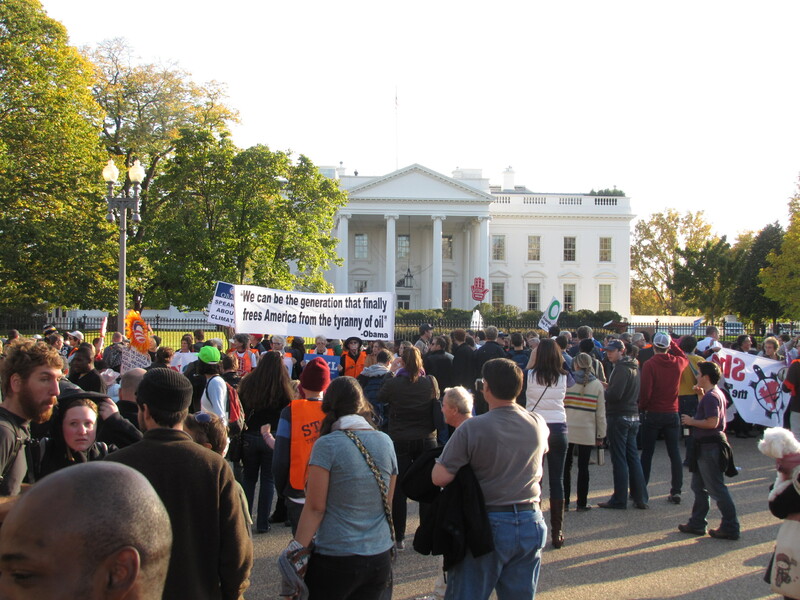 Organizers had hoped to encircle the White House with at least 4000 protesters but estimates placed the crowd at somewhere between 10,000-12,000. In attendance were folks from as far away as Florida, Ohio, California and, for course, Canada. I traveled down from Ottawa on a bus packed with about 50 enthusiastic students from Paul Smiths College in the Adirondacks of upstate New York. 20 hours on a bus over a 48-hour period (including one overnight) is not usually my idea of a good time, but it was well worth the trip. Below you will find interviews and video from the rally. Highlights included Naomi Klein’s rousing call to arms and her Canadian perspective on both Keystone XL as well as the equally outrageous, proposed Enbridge Northern Gateway pipeline to the west coast of B.C. (see video below). Maude Barlow of the Council of Canadians gave me a remarkably upbeat assessment of the prospects of stopping Keystone XL in its tracks. Having the chance to speak with leading climatologist and NASA scientist, James Hansen, was also a rare opportunity. In his speech (see video below), Dr. Hansen advocated putting a price on carbon emissions by taxing fossil fuel companies and distributing 100% of the proceeds to the public through a monthly dividend. He also said that one of the most important things people can do is to support the organization Citizens Climate Lobby. Perhaps most memorable, however, were the many conversations I had with everyday folks from all over North America, from farmers in Nebraska to college kids who helped get Obama elected in ’08 to seniors who were afraid for the future of their grandchildren. People are rightly pissed about this proposed pipeline and many have said they will do “whatever it takes” to stop it. Whatever it takes. Increasing our dependence on unconventional, dirty oil is not the kind of legacy we should be leaving for future generations. Yes, we need oil for now – nobody denies it. But according to James Hansen, the planet’s most important climate scientist, who was arrested at the White House back in late August/early September – opening up the tar sands to heavy exploitation would mean “it’s essentially game over” for the climate. 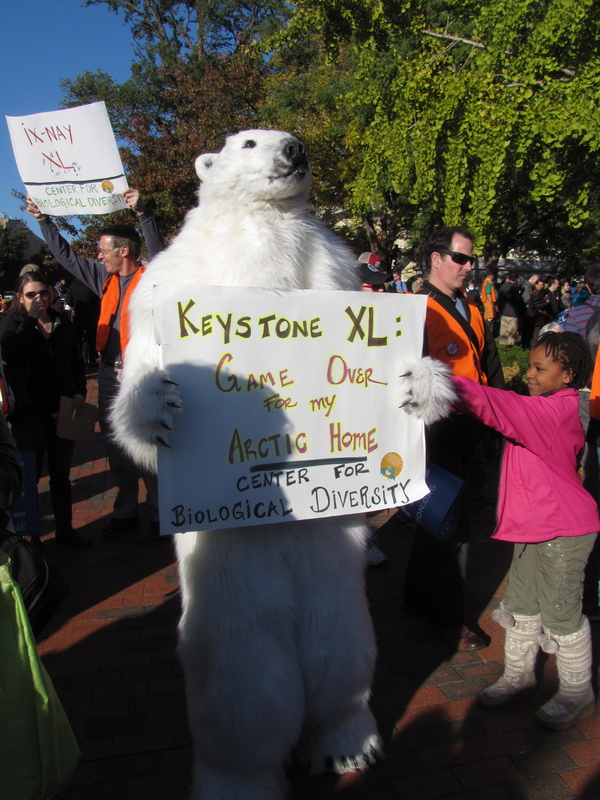 Building Keystone XL – which Bill McKibben described as “a 1,700-mile fuse to the biggest carbon bomb on the continent” – will only only ensure that our oil dependence will continue long into the future, our greenhouse gas emissions will continue to increase and long overdue investments in clean energy technologies will be further delayed. What is going on in Panama? And just what exactly are Canadian mining companies doing down there? 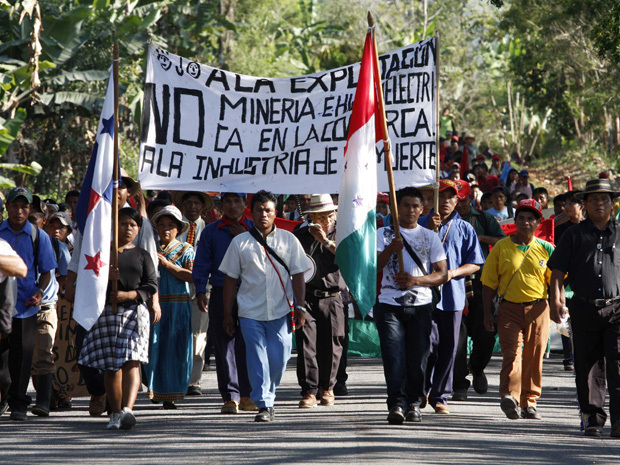 Dana Holtby and Rosie Simms, two McGill students currently studying in Panama, wrote an article in March and another recently about ongoing indigenous resistance to proposed international mining projects in the Central American country. It’s a fascinating story that has a strong Canadian connection so I talked to them to find out more about it. Click the audio player above to hear our interview on Skype. Having spent over a year in Panama myself, I know that strange things can happen there when big money resource projects are at stake. Case in point: two Spanish journalists and human rights activists residing in Panama were recently detained without charges, allegedly bullied and then kicked out of the country for documenting and supporting Ngäbe Indigenous protests against the Cerro Colorado mine in Chiriquí. Indigenous and environmental groups throughout Panama have been staging massive protests against reforms to the mining code, approved by President Martinelli in early February. Agence France-Presse reported that clashes between protesters and police erupted around the country when demonstrators set up blockades along the Pan-American Highway and demanded that Martinelli reverse the legislation.